After a year of significant legal market consolidation in 2012, do you think we will see more mergers involving UK law firms this year? If so, what kind of deals are most likely, and why? The capital has extended its position as the most buoyant legal market in the UK, with midsize London law firms continuing to outpace their regional rivals, notching up an average 10% increase in organic revenue this year compared to just a 5.5% revenue rise for non-London firms. The South, North and Scottish regions are among the worst performing markets for LB100 firms this year, with firms in those regions increasing revenue on average by just 1%, 5% and 5% respectively. 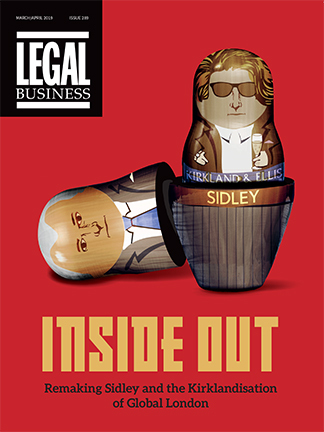 One year since he became Eversheds’ chief executive, Bryan Hughes is reshaping a business badly bruised by the downturn. Can he be the firm’s new messiah?